What are RealTracks? RealTracks replace the MIDI track for that instrument, and can be controlled just like the MIDI instrument (volume changes, muting etc.). They follow the chord progression that you have entered, so you hear an authentic audio accompaniment or solo. RealTracks are not "samples"... They are full recordings, lasting from 1 to 8 bars at a time, playing in perfect sync with the other tracks. 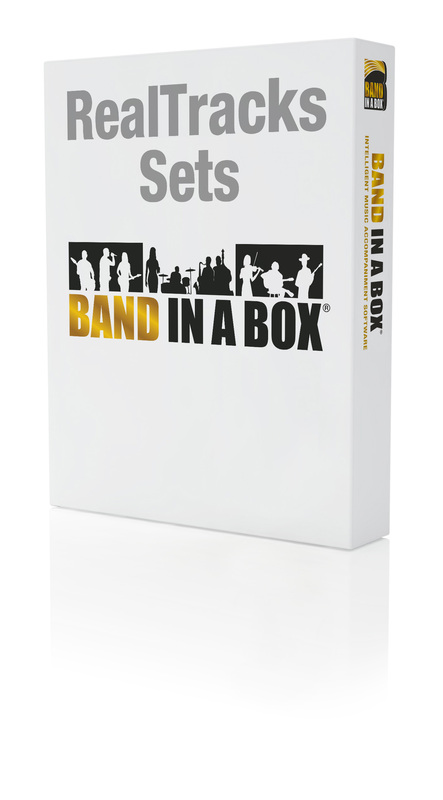 Choose from pre-made Band-in-a-Box® Styles, or combine RealTracks instruments to make your own band. You'll want to use RealTracks in all of your projects... and you can! Adding REAL instruments played by TOP MUSICIANS to your compositions brings an exciting human element ... and that's just the beginning! Wow! Over 2,500 RealTracks in the UltraPAK, UltraPAK+, and Audiophile Edition.! Over 2,700 hours of studio musicians recordings! The RealTracks have become one of the most popular additions in Band-in-a-Box® and RealBand. PG Music offers 300 RealTracks Sets, with over 2,500 RealTracks for Jazz, Country, Rock, Pop, Metal, Blues, Bluegrass and more! We've made it easy to get RealTracks Sets - ALL of the RealTracks Sets are included in the UltraPAK and Audiophile editions of Band-in-a-Box®. New RealTracks Sets 278-300 are included in the PlusPAK. Ready to take it up a notch? In RealTracks Set 300: Smokin' Fast Jazz Bass, Neil Swainson speeds to first place with this incredible collection of seven acoustic bass RealTracks that even the most proficient bass players would be in awe of! Want to try and keep up? The tracks all have built in RealChart notation to help you learn the parts! Note: This RealTracks Set requires Band-in-a-Box® 2018 for Macintosh or higher. Get ready to shuffle, slide, sway, and shake with the tracks included in RealTracks Set 299: Rootsy Blues Guitar & Piano. This set includes three guitar and two piano tracks. The folk blues guitar is played by non-other than virtuoso Brent Mason, while the blues and ragtime guitar tracks are played by the renaissance man himself - Colin Linden. Add in Mike Rojas on piano and it’s a rootsy blues trio that’s hard to beat! Hold onto your sombrero, the Mariachi band is here! For the first time ever, we’ve released authentic Mariachi RealTracks in RealTracks Set 298: Mariachi! To ensure a true Mariachi flavour, we’ve recorded traditional vihuela tracks along with nylon guitar with guitar sensation Ramon Stagnaroand as well as guitarron (a Latin American bass instrument) from the incredibly talented Juan Jimenez. Don’t miss out on these one-of-a-kind RealTracks! Can you ever have enough Smooth or Fusion Jazz? We certainly don’t think so – here are 10 more tracks to expand your library! With RealTracks Set 297: More Smooth Jazz &Fusion you’ll discover a world of silky bass tracks from Neil Swainson, fusion piano styles from Jeff Lorber,and smooth brushes and fills from Terry Clarke and Jim McGillevray! You’ll also find RealChart notation to help you learn, teach, and share your new song. Requested by our loyal customers, RealTracks Set 296 features a set of modern jazz basses & RealDrums. It features even styles such as a 16ths groove, a latin ballad style, and a jazz8ths style, as well as a slow jazz ballad bass with tasty, sparse lines. With a duo of jazz greats like Neil Swainson (acoustic bass) and Terry Clarke (drums), how could you go wrong? Who doesn’t love a little musical potpourri? In RealTracks Set 295: Jazz Potpourri with 12-key Guitar, Jazz-Soul Piano, Jazz Strings, and Percussion we give you nine jazz strings, guitar, piano, and percussion tracks to spice things up! This set features a lush background strings pad, electric guitar jazz comping with Oliver Gannon, Mike Rojas playing piano, and Jim McGillevray and Alex Acuna on the percussion. Some of our most popular recent RealTracks have been our exciting “Crooner Big Band” RealTracks, and with RealTracks Set 294 we’ve expanded this with our “CroonerShout” RealTracks. In Big Band music, the “Shout Chorus” is an arranged solo featuring harmonized instruments. With these RealTracks, that’s what you get: intricate soloing with all of the big band instruments harmonized! It features arrangements that utilize two alto saxes, two tenor saxes, flute, baritone sax, and 5 trumpets! And, the individual instruments can be used on their own as well as in the context of the entire ensemble. These tracks will make you feel like you’re floating through Venice in a gondola, sipping champagne at a French delicatessen, or tasting micro-brew at a Stolkholm festival. RealTracks Set 293: A Taste of Europe - France, Italy, and Sweden takes you on a European adventure – with fourteen accordion, guitar, bass, and drum tracks from the incredibly talented Cory Pesaturo, Quinn Bachand, Neil Swainson and Terry Clarke! Explore the unique and traditional celebratory music style of Eastern Europe – Klezmer! In RealTracks Set 292: Klezmer! you’ll rediscover polka with these nine accordion, bass, guitar, and drum tracks. For this set we called in the experts! Check out the demos to see how Cory Pesaturo (accordion), Neil Swainson (acoustic bass), Quinn Bachand (acoustic guitar), and Terry Clarke (drums) navigate this high energy, fast tempo style! RealTracks Set 291 features electronic RealTracks instruments with roots in Jamaican culture: Modern Dancehall. This set features a band of electronic drums and various synths, with percussive and spacey tones that will transport you! There are a total of 9 RealTracks in this set, as well as various combinations of A-B variations. Are you looking for that perfect percussion instrument to add the final touches to your song? RealTracks Set 290: More Pop Percussion Singles adds even more percussion instruments to our current library. Play along as in-demand session percussionist Jim McGillveray delivers a variety of shakers, congas, cowbells, tambourines, and woodblock! This set features an eclectic mix of different RealTracks for different purposes. We’ve added 3 new fretless bass styles playing a variety of pop grooves. In addition to that, there is a plethora of pop piano and organ styles from Nashville great Mike Rojas. And, to round out the mix, we’ve added two exciting new Punk RealDrums, which work great with our previously released Electric Guitar and Bass Punk styles! Every good Soul or RnB record needs a drum part you can really groove to. In RealTracks Set 288: Southern Pop Drums with Land Richards you’ll find seven different drum variations sure to get your audience swaying. Whether it’s a slow building jam or a faster tempo southern groove you’re looking for, world renowned session musician Land Richards has you covered! Check out the demos below to get a feel for everything this set has to offer! When was the last time you weresitting by the fire - wishing you had an acoustic guitar to map out the song that just popped into your head? With RealTracks Set 287: Pop Songwriter - Acoustic Guitar you have all the tools you need to turn that idea into a pop song reality. This set contains six acoustic guitar tracks from three exceptional Canadian musicians – Fintan O'Brien, Quinn Bachand and Colin Linden! With both notation and guitar charts built into every track, you can quickly learn your new song and play it for your friends at the next marshmallow roast! We’ve added more pop and rock RealTracks with two of Nashville’s finest musicians: Joe Robinson and Brent Mason! RealTracks Set 286: Pop & Rock Guitars with Brent & Joe features two electric guitar soloists and three acoustic guitar rhythm tracks. The soloists were recorded specifically geared towards the beginner musician, with simple, but very tasty licks. The rhythm acoustic guitars are great songwriting tools, and sound great used by themselves or in a band mix! Sit back and be transported to another time and place as you experience a blend of traditional Celtic jigs with a modern, folky twist. RealTracks Set 285: Celtic Piano & Harp includes eight Celtic acoustic piano tracks by Dave Milligan and three classical and folk inspired harp tracks by Sharlene Wallace. Recorded at various tempos and in both even and swing feels, these tracks are the perfect addition to any Celtic jig, reel, or polka! Introducing the sounds of The True North, strong and free! RealTracks Set 284: "Canadiana" Old Time Guitar, Banjo, and Foot Stompin' includes ten acoustic guitar, tenor banjo, and foot stomping drum tracks. Recorded with Victoria, British Columbia talent, Quinn Bachand, these tracks are sure to bring you back to your childhood and get you up on your feet! The name says it all! Looking for an authentic and soulful harmonica background for your country song? RealTracks Set 283: Jelly-Roll Country Harmonica includes six Kirk "Jelly Roll" Johnson harmonica RealTracks – recorded in both even and swing feels and fast and slow tempos. Complete with built in RealCharts, you’ll be able to see notation for the track and follow along as Jelly Roll Johnson plays his harmonica over any chord progression you enter! Have lyrics scribbled down but still searching for the perfect country sound to create your song? In RealTracks Set 282: Country Songwriter - Guitar & Keys you’ll find the acoustic guitar, piano, and organ tracks you’ve been dreaming of! With both swing 8ths and even 8ths styles recorded in a variety of tempos, Brent Mason (guitar) and Mike Rojas (piano) have created the perfect rhythm tracks for any country blues or country folk song you can imagine! Experiencing writers block? Have a listen to these RealTrack demos to find some inspiration! With RealTracks Set 281 we’ve added to our 12-key collection of RealTracks with exciting new Guitar, Pedal Steel, Electric Bass, and Piano styles! With many other RealTracks, they are not recorded in all 12 keys, but the missing keys are provided with automated pitch shifting. With these 12-key RealTracks, they were recorded in all 12 keys. This means that there will never be audio degradation from pitch shifting, and it also means that from a learning perspective you can always be confident that what you’re hearing is exactly what the musician played. And, it includes some of the worlds top session players, including Brent Mason on guitar, Eddy Dunlap on pedal steel, Mike Rojas on piano, and Byron House on electric bass! Looking for a faster tempo Americana vibe with a throwback feel? RealTracks Set 280: Americana - Gritty Blues & Rockabilly Swing is just what you need! This set features Nashville session musicians Byron House, Brent Mason, Colin Linden, and Mike Rojas playing acoustic bass, electric guitar, piano, and drums for two complete bands! Want to follow along with the pros? No problem - with the RealCharts notations built into the tracks, it’s never been easier! Note: This RealTracks Set requires Band-in-a-Box® 2019 for Macintosh or higher. One of our most frequent requests has been authentic “Americana” styles, and with this new set, we’ve provided! With RealTrack Set 279: Americana: Slow Groovin' 12-8 & 16ths you’ll find bass, guitar, and fiddle parts played by authentic Americana artists – straight from the heart of Nashville! With this RealTrack Set, you’ll be able to create tracks for your songs played by the incomparable Byron House, Brent Mason, Colin Linden, Andy Leftwich, and Bryan Owings! With built-in RealCharts, you’ll be able to follow along with notation – an invaluable learning tool for any musician! For the first time ever, you can generate backing vocals in Band-in-a-Box with amazing “ooos” and “aahs” vocal arrangements! Included with RealTrack Set 278: Shiny Vocals Ooos and Aahs, is a three-part, six-voice arrangement – which you can use all together in your song or individually for more delicate textures! The male and female parts were recorded by renowned Nashville vocalists David Wise and Shelly Justice. Check out some demos to discover the possibilities! Get access to one of the most accomplished session drummers from Nashville: Shannon Forrest! Set 277 includes eleven RealTracks in a variety of drum styles from Pop Rock to Modern Pop Ballad. This is one set you do not want to miss! The feels between each of the RealTracks are mixed between even and shuffle, making RealTracks Set 277 an excellent fit for any project that demands professional drumming! Note: This RealTracks Set requires Band-in-a-Box® 2017 for Macintosh or higher. RealTracks Set 276 offers a wide variety of popular percussion instruments including Agogo bells, Bongos, Congas, Tambourine and more! Most of the RealTracks in this set are played in even style, making it a great option to give your percussion tracks the final touches it needs. Add these seven RealTracks to your library today! Bring back the classic 60s drum sound to your studio with RealTracks Set 275! Influenced by the classic rock era of the 60s, set 275 brings a range of different rhythms, best suited for Surf Pop, Mo-Town, and Rock-n-Roll! It has both even and swing feels, along with upbeat tempos throughout each of the RealTracks. This collection includes big bass drums, popping snares, airy hi-hats, and sizzling’ tambourines! Great for any project involving percussion! Coming straight out of the jukebox, RealTracks Set 274: Hard Rock Straight Ahead is here! Includes fourteen (Yes fourteen!) RealTracks of thrash guitar riffs, moving bass-lines, edgy guitars and expressive progressions. You won’t want to miss out on this set. All the RealTracks are recorded in even time and the tempo ranges from mid to fast. All influenced by 70s Rock, Grunge, and more! Listen to some of demos’ - you won’t be disappointed! This Hard Rock shuffle set is guaranteed to get you jamming in no time! RealTracks Set 273 is here bringing eleven RealTracks of content filled with crunchy guitars, groovin’ rhythms and catchy riffs! This set includes medium tempo to pedal to the metal Realtracks, influenced from British Hard-Rock, Punk, and more! RealTracks set 273 also supports Direct Input functionality giving you full control of the guitar tone! Ready to cruise the highway? Pick up RealTracks Set 273 today! RealTracks Set 272 offers twelve distinct RealTracks dedicated to Rap and Hip-Hop! These includes chest rattling bass drums, sizzling hi-hats, cracking snares, earth shaking sub basses, synthesized strings, and more! Each of the RealTracks are in common time and will work well with any RealTracks Sets you already have. Experiment with these to come up with great new ideas! Don’t miss out! Get the party started with Tropical House RealTracks Set 271! Featuring twelve RealTracks of synthesizer glory, these upbeat nightlife sounds of Ibiza will keep you dancing all night long! Set 271 Includes synthesizer leads, bass lines, piano, and organic percussion lines! All accompanied with a thumping kick drum designed to rumble the room! Don’t miss out on this exciting set. All of these are in even time signatures and will combine well other RealTracks - great for coming up with new ideas! This is an awesome set of feel-good guitar RealTracks played by the ever-impressive Zane Carney. If you're looking for strong rhythm guitar tracks played at the same caliber that he gives to some of the greatest musicians in the world, these Pop Waltz RealTracks are for you. A versatile set of both straight-ahead and swung 8th and 16th note rhythms make this a must-have for Pop afficionados. Direct Input recordings of all the RealTracks in this set allow you to control the tone – it's like having Zane Carney in your band! Set 269 offers eight smooth RealTracks that feature the guitar playing of Brent Mason with Mike Rojas on keys. These are some real slow burners that will please musicians who are trying to craft their own masterpieces. Mike and Brent play in perfect unison, offsetting subtle wah guitar with a straight-ahead acoustic piano progression, or ducking around a driving organ riff with a classic single-coil rhythm guitar sound. Brent's solos here are exploratory and rewarding, and mix wonderfully with Mike's confident right-hand comping. This is a set of wonderful Gypsy Jazz RealTracks in the modern tradition, with piano, nylon-string guitar, and accordion all swapping between rhythm and lead duties. There's a set of world-class musicians here, with the likes of guitarist Quinn Bachand, pianist John Jarvis, and accordionist Cory Pesaturo all going to work. Lovers of Gypsy Jazz will find much of interest here, with more sprightly runs and dimished-scale phrases than they can shake a stick at. The six RealTracks in this set can be twisted and shaped into the user's most far-out Gypsy Jazz desires, and leave plenty of room for Reinhardt roleplaying as well! It's all about the Blues with RealTracks Set 267. What else would you expect when you put Brent Mason and Mike Rojas in a room together? Brent solos over the Blues in every which way – he swings, he shuffles, he plays it straight. Several of these RealTracks are in 12/8, and because of Brent and Mike's versatile playing, this means you now have a huge variety of guitar solos at your fingertips, not to mention piano rhythm tracks that run the gamut from gentle acoustic piano accompaniments to dirty and distorted organ licks. This is a huge set of fifteen RealTracks – any Blues musician would do well to add these killer recordings into their collection. RealTracks Set 266 features a wide variety of great jazzy & funky RealTracks. It includes such diverse RealTracks as jazz waltz soprano sax, rockabilly jive guitar soloing, and dixieland banjo! There are also exciting funk RealDrums, and tango piano. And, to top it off we're including 2 "12-key" jazz guitar comping styles. These RealTracks were recorded in all 12 keys, so there is no digital pitch shifting of the audio, which means the audio quality will be pristine no matter what key your song is in! Crooner styles are back by popular demand in RealTracks Set 265! This Big Band Ballad influenced set will soothe your soul. Included are a grand range of smooth horns such as alto saxophone, flugel horns, tenor saxophone, trumpets, and more! Float away with all twelve tracks, each of them played in traditional Jazz swing. RealTracks Set 265 is excellent for any project, listen to our demos and find out for yourself! Our popular Crooner styles are back and are included in RealTracks Set 264! These smooth background Bossa RealTracks help set the mood for a sophisticated evening. This includes a stylish variety of elegant Jazz horns including tenor, alto, baritone, muted trumpets and more! RealTracks set 264 is played with an Even feel style. Shaken or stirred, get these Classy Crooner Bossa Horns in your collection! Looking to add more variety to your collection? Look no further! The Songwriters Guitar and Cello Toolkit is here! This versatile set offers eleven new RealTracks including rhythms, backgrounds, finger-picking, resonators, and even a soloist! The diversity of this RealTracks set is phenomenal for any genre including Classical, Folk, Soft-rock and more! Get inspired, pick up your copy of this incredibly well rounded collection today! Add the sound of one of Nashville's finest session drummers to your studio! If you listen to country radio, there’s a good chance you've heard of drummer, Shannon Forrest. Shannon has built a reputation as a session ace, and is constantly in demand by chart-topping artists! This exclusive set includes five RealTracks in various rhythms including driving pop 8ths, modern styles, pop 16ths, and more! Add Shannon Forrest to your collection today and get access to one of the best session drummers in the industry! Aloha! Discover paradise with the Hawaiian sounds of RealTracks Set 261! This collection of Hawaiian swing Realtracks features traditional ukelele and pedal steel, which are perfect for that laid-back island vibe. The pedal steel also comes with a Direct Input option so you can create your own tones! Sit back with the soothing Sounds of Hawaii! Become entranced listening to thecaptivating, and magical serenades of Sharlene Wallace, one of Canada’s most influential harpists! You'll lose yourself in the symphonic melodies of the Celtic styles, Waltzes, even 16ths, and classic jigs in this elegant RealTracks set. Add this golden award winning harpist to your RealTracks collection today! Enjoy the hearty sounds of Celtic instrumentation with RealTracks Set 259! This includes 6 diverse Realtracks with influences in Polka and Folk! The different rhythms include Ev16s, Swing, and Triplets shuffle. The tempos range from slow ballad-type to galloping upbeat rhythms. This Celtic RealTracks set also includes acoustic guitars, piano, and even an auto harp! Be sure to add this to your collection today! Take a trip to the island of Puerto Rico with this traditional Latin American RealTracks Set! These 9 RealTracks are dedicated to exploring traditional Latin American music! A variety of styles are available from sweet 16th picking on nylon guitar to genuine walking bass lines that will keep you tapping your toes! Featuring instruments like Maracas, Guiros, Chajchas, Charango, Bongos, and more! Add these authentic sounds to your RealTracks collection - Don’t miss this fiesta! Straight from the streets of Peru, these ethnic Peruvian RealTracks styles are the worldly sounds you're looking for! These RealTracks include a wide range of authentic instrumentation including ethnic percussions such as Cajon, Cowbell, Quijada, and Castanets! his RealTracks set also features nylon, and bass guitars, played traditional Latin American rhythms! Get your ticket and explore these new Peruvian sounds today! Named one of the "Top Ten Session Guitarists of All Time," Brent Mason takes the spotlight on this RealTrack set! Featuring warm tones and clean picking rhythms, this easy to listen to collection of nylon guitar will be a classic set for years to come. Each RealTrack contains sweet picking tones to Classic Country riffs and more! There are a total of 8 RealTracks included with this set, each each with their own unique playing style. The performances in RealTracks Set 256 are diverse ranging from ballads, contemporary Country, and Waltz styles. Add Brent Mason to your collection today! RealTracks Set 255 adds 4 new pedal steel RealTracks to your library, with exciting modern sounds! These RealTracks will sooth your soul! With Eddy Dunlap performing on each RealTrack, this collection ranges from warm, sunny sounds to cool breezy passages. There is a "dreamy" Country ballad, and a "George" style that will mellow your mood, and a spacious and somber sounding RealTrack that's great for a relaxing day. Finally we have an upbeat jam with crunchy and crisp tones that is perfect for those long drives! These RealTracks contain many slower riffs and long pedal steel passages, excellent for accompaniments! Each RealTrack was recorded with the artists unique tone, but each one also has a "Direct Input" option, allowing you to create your own sound! Combine these with other styles to get some incredible results! We are excited to introduce two new features in this RealTracks set - 12-key instrumentation and Hi-Q notation! This one-of-a-kind set features the talents of Mike Rojas, Brent Mason, and Eddy Dunlap! 12-Key instrumentations are recordings of all instruments in all twelve keys! This improves the quality of audio by removing the need to transpose these RealTracks digitally. What you hear is exactly what was recorded in the studio! Hi-Q Notation offers improved notation functionality for the Guitar and Pedal Steel RealTracks, which provides accurate transcriptions of bends, slides, hammer-ons, pull-offs and more! This also allows transcriptions that are easier to read and learn! Including Brent Mason on Guitar, Mike Rojas on Piano, and Eddy Dunlap on Pedal Steel, each suitable for any genre! These Tracks also include Direct Input for both Guitar and Pedal Steel so you can sculpt your own tones! Add this definitive set of RealTracks to your collection today! There is an incredible collection of acoustic guitar RealTracks bythe amazingly talented Joe Robinson in RealTracks Set 253! All of the different styles have a high and a regular performance, which are selected as separate RealTracks. The first style is a slow swinging waltz acoustic guitar with a high and a regular RealTrack. The next style of playing is a Nashville swing style at a medium slow tempo, both high and regular versions. Also included is a BoomChick style that has an even 16 feel at a medium tempo and these also come in a high and regular. Finally, there is a slow BoomChick swing style that has both a high and regular part; you can select "Simple" versions of the BoomChick RealTracks in the RealTracks picker. This removes any embellishment from the playing when the RealTrack is generated. All of these RealTracks include RealCharts which can be viewed in the notation window or the lead sheet window. Plus, you can follow along on the fretboard in the guitar window. Joe Robinson is such a skilled guitar player, and we are incredibly fortunate to capture his performances for RealTracks set 253! Note: This RealTracks Set requires Band-in-a-Box® 2016 for Macintosh or higher. RealTracks Set 252 includes an amazing assortment of Pedal Steel playing a variety of Modern Country background styles. The first RealTrack in this set is a "Dreamy" even 16 pedal steel playing at a slow tempo. The next RealTrack is a "Pop Country" style with an even feel at a medium tempo. Next we offer a ballad "Atmosphere" pedal steel played with an even 16 feel; A "Crossover" swing 16 pedal steel, which is at a medium to slow tempo, depending on the other instruments you accompany with. The final RealTrack included is an up-tempo waltz style with a swing feel. All of these RealTracks include RealCharts which can be viewed in the notation or lead sheet window. The included Direct Input (DI) versions can be selected in the RealTracks picker. Since all of these pedal steel RealTracks are "background" styles, they sound best when added to a song when another layer of sound is required that won't distract from the overall song. Start experimenting with RealTracks Set 252 and you will truly be amazed at the sound possibilities! RealTracks Set 251 is all RealDrums! That's right… an entire set of RealDrums playing all traditional Celtic percussion utilizing the bodhran and the spoons! Each RealDrums groove is included on both bodhran and spoons. These include the Polka, Slide, Reel, Slow Reel, Jig, HornPipe and Slip Jig. Each of these styles of music has its own unique feel, like the Polka which is a two beat style, or the Slide which is in 12/8 time. Try combining these RealDrums with other Celtic RealTracks and you will have your own Celtic group before you know it! If you want to create some traditional Celtic music and you need your own personal rhythm section, look no further than RealTracks Set 251. With RealTracks Set 250 we offer a swinging Rockabilly electric guitar, acoustic piano, and drums like you have never heard before! The electric guitar is a rhythm style from the amazing session artist Brent Mason. It’s an up-tempo swinging Rockabilly style with a classic Rockabilly tone, echo and reverb, with some amazing licks played as well. There is also a direct input RealTrack available in the RealTracks picker which will load the Amplitube plugin to create a unique amp sound for the electric guitar. The acoustic piano plays a swinging Rockabilly style with lots of classic Rockabilly phrases of 8th notes and triplets. You can see the RealCharts for these RealTracks in the notation or lead sheet window. You can also watch what’s being played on the piano in the Piano Window and see the guitar on the fretboard in the Guitar Window. The RealDrums in this set are playing a swinging BoomChicha style which fits perfectly with the RealTracks in this set. There are six RealDrums variation made into 15 different substyles to choose from in the RealDrums picker. Get ready to use RealTracks Set 250 to create some vintage sounding songs in a Rockabilly style! RealTracks Set 249 includes some down home "Old Time" Folk RealTracks like the banjo, acoustic guitar, and fiddle. These RealTracks sound amazing when combined in a song and some of them, like the acoustic guitar "Folk Sorrow," stand out on their own. The first RealTrack is the banjo clawhammer playing and even 16 "Old Time" style at a medium tempo; the clawhammer refers to a unique style of picking used on the banjo. Also included are three acoustic guitars, one a "Groovin' Folk" swing 16 style , another an even 16 "Old Time" style, and then the "Folk Sorrow" style also with an even 16 feel. The final RealTrack is a soloist fiddle playing a Celtic Reel style with an even 16 feel at a medium tempo. All three of the acoustic guitars and the fiddle have RealCharts available which will show you the exact notation for each RealTrack. You can view the notation in the notation window or the lead sheet window or see what is being played on the guitar in the guitar window. RealTracks Set 249 has such a variety of instruments and grooves, there is no doubt that you'll be having hours of fun creating your own "Old Time" Folk songs! For the first time ever we are bringing you Oberkrainer RealTracks! The Folk music of the Alps! The Oberkrainer sound originated in Austria but since has moved to many different areas of the Alps where this unique style of music is immensely enjoyed. The instruments included in this folk style of music include the accordion, acoustic guitar, and a horn section made up of baritone horn, clarinet, and trumpet. The first seven RealTracks all have the same feel, starting with accordions playing an "Old World 2 Beat" style, and an "Old World 2 Beat Held Plus" style. Next we have an acoustic guitar playing the "Old World 2 Beat" style; the horn section playing in this style can be selected as a RealTrack with all three instruments at once or you can select the baritone horn, trumpet, or clarinet to play as a single instrument track. All of these RealTracks are at a medium fast tempo and are played with an even 16 feel. The next seven RealTracks are an "Old World Waltz" style and are played at a fast tempo. These instruments include two accordions, one playing the style straight and one playing a held plus style. Also played in this style is an acoustic guitar and a horn section of clarinet, baritone horn, and trumpet. This horn section can be played all together or each instrument individually. When all of the separate instruments are combined into a classic Oberkrainer chord progression you will be blown away by the accuracy of the sound and your ability to control your own band with your keyboard and mouse. RealTrack Set 247 is all RealDrums! A versatile selection of brushes, shakers, and tambourines laying down a simple beat are included! There are four different brushes styles, all just a simple brushes and snare, no full kit used here! The first two styles are Boom Chick styles; one an even 16 style, the other a slow swing 16 style. The next two brushes play a folk style; one an even 16th style, the other a swing style. All of the brushes styles include an A and B section with separate grooves for each. These are great for laying down a simple rhythm track in a stripped down Folk song. Next we have three shaker RealDrums: one a Celtic even 16 style, one a Folk even 16 style, and finally a Folk swing 16 style. Also included are two tambourine styles: one a Celtic even 16 style, and another train even 16 style. All of these RealDrums can be used through an entire song or they also sound great when added to a breakdown section of a song. With RealTracks Set 247 you get a wide range of sounds and grooves which you can experiment with whenever you feel like creating your own sound! RealTracks Set 246 includes four unique Country "Bent-Note" acoustic piano RealTrack from legendary player John Jarvis. "Bent-Note" refers to the style of playing which frequently uses grace notes into the third of the chord, closely as possible emulating the sound of a guitar bending notes. This style of playing was made popular by the great Nashville pianists of the '50s & '60s and it's performed expertly by John Jarvis. The first RealTrack is an acoustic piano Country ballad even style; this is a laid back style which sounds amazing when combined with similar RealTracks. The next three RealTracks are all Country "Bent-Note" swinging acoustic piano styles but at slightly different tempos. The tempo range starts at a slow ballad but increases all the way up to a fast tempo. You can view the RealCharts for all of the included acoustic piano RealTracks in the notation window or the lead sheet window. These acoustic piano RealTracks all sound amazing when combined with other Country RealTracks and have a playing style which has not been available before as a RealTrack. Choose RealTracks Set 246 today, and you can have the amazing John Jarvis play your song while you sit at your computer! You'll find an amazing collection of electric guitar and baritone guitar rhythm and soloist Country Blues and Rock styles all from the talented session great Brent Mason in RealTracks Set 245! The first two RealTracks are electric guitar rhythm styles; one is played high up on the guitar fretboard, and the other is played in a more standard position - together they make a powerful rhythm section! Add to this rhythm section a superb soloist playing a Country Blues and Rock style and you have three talented guitarists playing along with your song. The soloist guitar has notation available in the notation window. These three guitars have Direct Input (DI) options available in the RealTracks picker. Also included in RealTracks Set 245 are two baritone electric guitars: one is a Pop Country style with an even feel at a medium tempo and the other is a Country Workin' style with an even 16 feel at a slightly slower tempo. Both of the Baritone guitars have Custom FX RealTracks that can be selected in the RealTracks picker. This will load up the direct input version of the baritones along with the Amplitube plug-in which allows you to craft your own amp sound. RealTracks Set 245 offers some amazing playing from Brent Mason which you can enjoy when you create your next Country, Rock, or Blues song! Looking for a smooth background Horn section playing either a ballad or a medium tempo swing from the super talented Jack Stafford? RealTracks Set 244 is your answer! Both of the two part horn sections included in this set are made up of tenor and alto sax. The first RealTrack is a medium tempo horn section playing a background swing style; the background refers to the fact that these styles are not busy and do not stick out in a song. They are nice harmonies between the two saxophones and blend into the background of a song. The next RealTrack is a slow ballad two part horn section with a swing feel. The individual instruments in each of these horn section RealTracks is also available as a RealTrack in the RealTracks picker. If you want to hear just a background ballad tenor or alto you can select that RealTrack and add it to your song. Each of these RealTracks also includes RealCharts which can be viewed in either the notation window or the lead sheet window. Try out RealTracks set 244 and you'll be adding a swinging horn section to as many Jazz songs as you possibly can. With RealTracks Set 243 there are some amazing Baritone and Resonator guitars RealTracks playing some real low down blues. The first RealTrack is a baritone electric guitar playing a blues shuffle with a slow tempo; the baritone guitar plays a bass part as well as blues licks at the same time. The second baritone guitar also plays bass and licks together, but this time slightly faster with an even feel. Both baritone guitars have a Direct Input (DI) version available in the RealTracks picker. The next guitar is a shining resonator guitar that plays an even feel blues based on 8th note phrases. The final RealTrack is another incredible resonator guitar, this time played with a funky swing 16 feel at a ballad tempo. You'll be sure to find the right RealTrack to take a previously made or a brand new blues song to the next level with RealTracks Set 243. RealTracks Set 242 is powerful! This Set includes 7 different RealTracks and 3 different Drum styles. First you get a basic electric bass that plays long held chords with a slight pick-up played before the chord change. Second is an electric bass playing walking style on a 5 string bass. The third RealTrack combines these two separate RealTracks into one RealTrack with the basic style playing the 'A' section and the walking style playing the 'B' section. Next is the Organ, with its awesome whirling sound at sharp attack with the right hand, and long held chords with the right. The acoustic piano has two separate parts, a basic style with long held chords and soft melodic passages before the chord change, and another where the attack is heavier - after the held chords there is a poppy transition to the next chord. You can use these different pianos as individual RealTracks or you can use the RealTrack which has the basic style in the 'A' section and the busier style in the 'B' section. The 3 different RealDrums are PraiseBreak, PraiseBreakHat and Praise BreakHeavy. The first two have 5 substyles to choose from, and PraiseBreakHat has 6 substyles to select from. When all of these RealTracks are combined into a song it's like you're standing in a church listening to one of the best bands you have ever heard lead you in an uplifting song that brings out the praise! RealTracks Set 241 adds a Swingin' Funk band with exciting new electric bass, electric guitar, organ, electric piano, and Funk RealDrums to your library! The electric bass, electric guitar, organ, and electric piano are all playing a swinging sixteenth Funk style at a medium tempo. The electric bass lays down a smooth groove while the electric guitar adds a wahwah effect to the chords it plays in the middle of the fretboard. Both the electric bass and electric guitar include Direct Input (DI) versions which can be selected in the RealTracks picker. The electric piano has a warm, classic tone and the organ plays swirling held chords. All of the RealTracks include RealCharts which can be viewed either in the notation or lead sheet window. The RealDrums are all swinging Funk, and include such styles as Funk New Orleans, Funk Swing, Funk Swing Tambourine, Funk Swing 16, and an even 16 Funk style with a slight swing. All of the RealTracks and RealDrums in Set 241 add up to one amazing swinging funk ensemble ready to play whatever you have in mind! RealTracks Set 240 includes an amazing collection of Funk RealTracks, including electric guitars, electric basses, organ, electric piano, and drums! The first two RealTracks are a Funk Half Note Pulse and a Funk Half Note Pulse Syncopated electric bass style both played at a medium tempo. The next three electric bass RealTracks are Funk Pumping styles, one playing quarter notes, one playing 8th notes and one playing 16th notes - all with an even feel at a medium tempo. Next we have electric guitar wahwah with one a rhythm style, a single note background style, a chording style, and another with just the sound of strings being scratched and effected with the wahwah. All of these wahwah electric guitar styles have an even 16 feel and are at a medium tempo. The electric bass and electric guitar RealTracks also include Direct Input (DI) versions which can be accessed in the RealTracks picker. The final two RealTracks in this set are organ and electric piano tremolo, both playing with an even feel at a medium tempo. All of the RealTracks in this Set, excluding the electric piano, include notation which can be viewed in the notation window. Also included in Set 240 is a large collection of Funk RealDrums! The Funk RealDrum names include Half Note Syncopated, Half Note Pulse, Half Note Pulse Tambourine, Funk16ths, Funk ‘70s Pop, Funk Disco, Funk Georgia, Funk Upbeat, Funk Upbeat Tambourine, and Funk Syncopated Snare. With all of the instruments included in RealTracks Set 240 you'll have no problem creating an amazing Funk band which can groove out with you anytime you want.